Here’s something you don’t see everyday; a vitamin infused e-liquid that contains Vitamin C, Vitamin B12, Echinacea, and in some cases Caffeine. 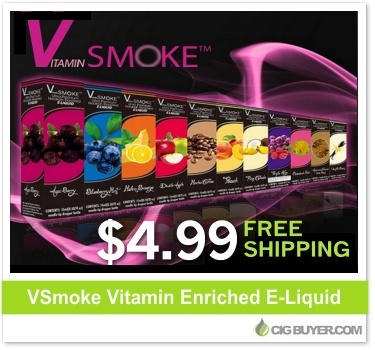 Vitamin Smoke E-liquid, also referred to as VSmoke, isn’t the only vitamin enhanced e-liquid on the market (Vapor Boost comes to mind), but at 50% OFF (with free shipping) it’s definitely worth mentioning. To be honest, we’ve never tried a vitamin infused e-liquid before and we’re not sure how beneficial it actually is, but if you wanted to give it a try, this might be a good opportunity. * No special coupon code is required. Offer good while supplies last.